The other night Mister and I went to Panda Express. 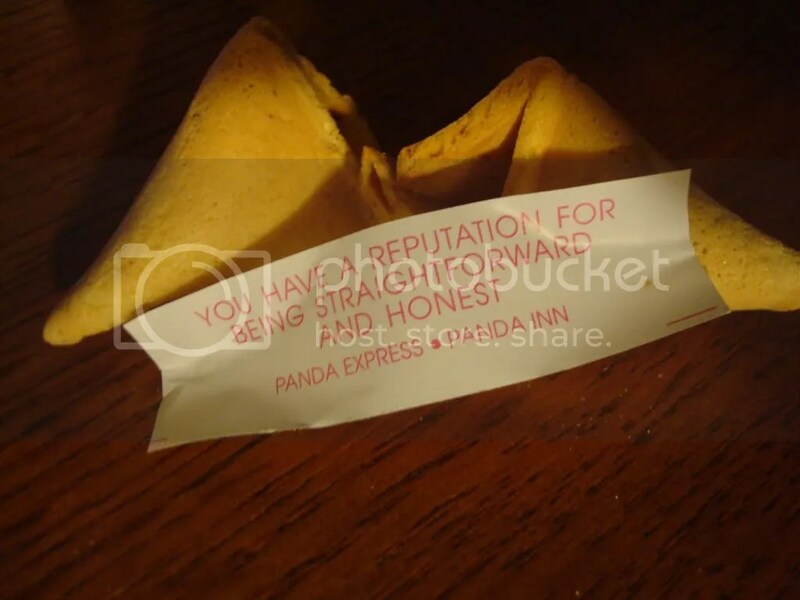 I hate the taste of fortune cookies, but I absolutely can not leave the table without seeing what my fortune says! I laughed and told Mister I got HIS fortune. You see, Mister is the most honest person I know. He is a straight-shooter, and doesn’t beat around the bush about anything. He doesn’t see any point in lying, because you’re simply cheating the other person out of a truth. Whether the truth is hurtful or not, you *must* be honest. However, you *must not* be hurtful with your honesty. Those are two very different things, and I have seen him struggle with trying to be as kind as possible to someone while keeping his integrity in tact and remaining true to himself and that other person. It is incredibly unfair to people to let them believe something that isn’t true. Not something I had considered before meeting him, since I always told people what I thought they wanted to hear. Strangely, his straight-forwardness is something that has taken some getting used to. In hindsight, I was not raised in an environment where straight-forwardness was accepted, if you weren’t the parent. Directness was not valued, if it wasn’t beneficial to the other person. There could never really be an open and honest conversation about anything that wasn’t mutually agreed upon. As far as I was concerned, it just saved a lot of grief just to tell people what would please them and not cause any conflict, rather than be direct with my true thoughts or feelings. Yes, he definitely had MY fortune. I have always put what other people think and feel before my own thoughts and feelings. Therefore, most of my decisions and/or actions have typically been based on other people. Whenever I’ve doubted myself, I’ve always looked for validation from others. Am I thinking right? Am I doing right? Should I do something else? A big reason that I started blogging is to try to grow as an independent individual with the ability to think and speak for myself without worrying what others think. I have been doing so much better at that, with Mister encouraging me to follow what I think or feel. He knows I am a validation seeker, and when I try to get that from him, he gently guides me back to ME. He reminds me that I am a smart, thinking, responsible adult, and I do not need his or anyone else’s approval for what I feel and think; that I must let my “instincts guide me”. 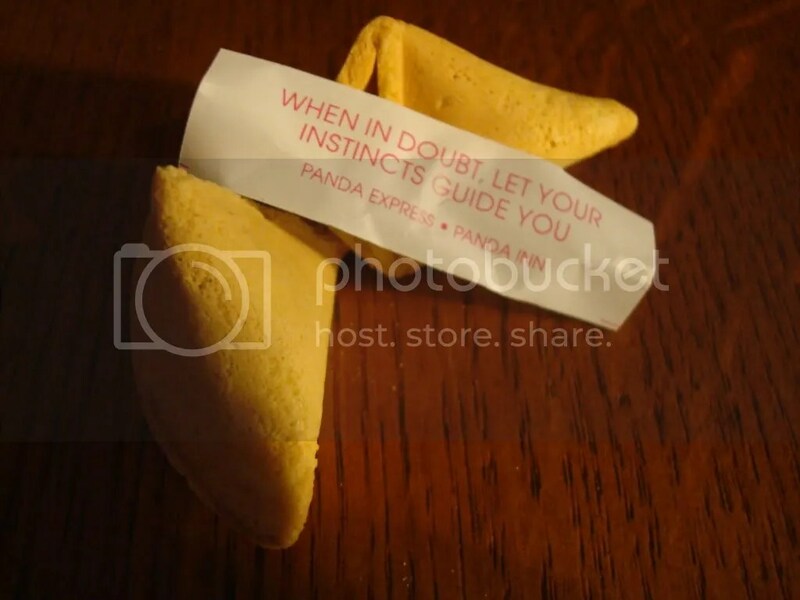 Fortune cookies. Sometimes they’re silly, and you can add “between the sheets” or “under the table” to make them funny. And sometimes, well sometimes, they’re just extremely thought-provoking. I’ve always been very straightforward and direct, which has led to many people disliking me initially and then coming to appreciate me later (if they stick around). My old officemate and dear friend found abrasive the way I’d say, “Your belief is irrelevant” when I’d ask him about some transaction or another. Then he started saying it to me, and then those around him. I want people to know that what I’m saying is exactly what I mean. No guessing, no trying to read between the lines because it’s there. It’s a little different on the blog because it’s immortalized. In that context, I make sure to ask folks I reference in the blog for their blessing before I post it. But as re: my own feelings and such? Better out than in, although I do very much try to be straightforward in ways that are not hurtful. That bit did not come as easily, but instead as part of accepting a job as a contract negotiator. Life has been a lot easier for tools I’ve learned on the job, even if the job itself has sometimes been stressful. I really have wished that I could be so direct as both you and my Mister. Having grown up where straight-forwardness is not appreciated and what people say is not what it seems, it is very refreshing to be around others where reading between the lines is not required. I used to disregard what people said, and instead watched what they did. It was far more enlightening and I was less apt to get into any conflicts. Therein lies my difficulty with this… That I did not (and do not) want to cause, or be part of, any conflicts. However, I have finally realized that sometimes sacrificing your thoughts and feelings is not worth avoiding a conflict. I’m not sure I ever said “Your belief is irrelevant” to anyone…LOL. My biggest fear is that when someone tells me something that is very incorrect, if I don’t correct it, then I believe I have given my tacit agreement…and when they go tell someone else the incorrect information, they are now able to back it up with my “agreement” with their position. Then it goes on from there to be a strengthened untruth. Sooo….I never feel that I have any option but to correct, in as gentle of a way as possible. Sometimes, that still looks like I’ve used a sledgehammer. I have been the recipient of a few “Better check that before repeating it” comments from Brad, so I know where your coming from!